Are You Looking for the Ways to Prevent Your Wrinkles? As we get older, we may start to notice the signs of aging. It doesn’t matter if you are a man or a woman; at some point, we all get there. When, where and how well or fast we age is dependent on a variety of things: genetics, skin type and your personal choices. The signs of aging can become apparent at any age. This is especially true for people who spend a great deal of time in the sun or who have habits, such as smoking. Home Remedies – Home remedies are common for people trying to fight wrinkles, because over-the-counter wrinkle creams can be expensive. It’s not always easy for people to get prescription medication either. The first home remedy is to change to a healthy lifestyle if you’re already not living one. That means eating healthy food, making sure you get enough vitamins and partaking in daily exercise. It is equally important that you are getting enough sleep. Additionally, home remedies include sleeping on your back and avoiding the sun. If you do have to spend some time in the sun, be sure to protect your skin with protective clothing and sunscreen. Reapply sunscreen every two hours. Cosmetic Surgery – Cosmetic surgery is another way to reduce the appearance of fine lines and wrinkles. There are three types of wrinkles. When the facial muscles that are attached to the overlying skin contract, the motion eventually cause dynamic wrinkles. The skin bunches together, which forms lines. The eyebrow area, forehead area and upper cheek area near the corners of the eyes (crow’s feet) are the most common areas for dynamic wrinkles. Muscles in these areas can be permanently weakened with surgery. Wrinkle Creams – Nelson Lee Novick, M.D., FACP, FAACS and Clinical Professor of Dermatology at Mount Sinai School of Medicine in New York City states that different anti-wrinkle ingredients perform different functions on the skin and that several common ingredients have a proven record of success in fighting the signs of aging. What are the Common Ingredients in Anti-Wrinkle Creams? Retinol – a vitamin A derivative, which stimulates exfoliation and new cell production, stimulates collagen production and new blood vessel formation, to make the skin brighter, more lustrous and less wrinkled. Hyaluronic Acid – Helps moisturize, hydrate and plump up skin, diminishing the appearance of wrinkles and fine lines. Acetyl Hexapeptide – Helps to relax facial tension and reduce wrinkles immediately. It deters the degeneration of collagen and elastin, smoothes the skin and reduces the depth of lines and wrinkles. Palmitoyl Oligopeptide and Palmitoyl Tetrapeptide – Research has proven that these peptides stimulate collagen production and growth of connective tissue. As effective as tretinoin but without the irritation. Syn-Ake – The efficacy of the SYN-AKE reduces muscle cell contraction and its action having a smoothing and anti-wrinkle effect decreasing wrinkle depth up to 52% of wrinkle size. 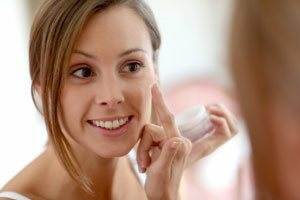 Why Do People Love Anti-Wrinkle Creams? People are drawn to wrinkle cream because it’s one of the most inexpensive options available for wrinkle repair. Anti-wrinkle cream can be used to unclog pores and to help build collagen in the skin. Both help improves the look and feel of skin and can reduce fine lines and wrinkles. Prescription creams offer wonderful results, but you can find improvement with some over-the-counter creams. A high price doesn’t necessarily mean it’s the best quality, although many of the products that have been reported to work do have higher price tags. “Anti-aging creams work through different mechanisms, depending upon the particular agents contained in them. Certain ingredients have, however, stood the test of time. I generally recommend purchasing products containing these ingredients with a long and successful track record”, asserts Dr. Novick. Does Anti-Wrinkle Cream Really Eliminate Wrinkles? Although anti-wrinkle creams can help reduce the appearance of wrinkles, they are not permanent fixes. What they do accomplish is to remove the outer layer of dead skin. They also help to hydrate the skin and to temporarily plump up the skin. Creams need to be used for a minimum of 30 days before results will be visible, however, if the patients stop using the cream, the results will disappear. Shall I Start the Use of Wrinkle Cream in the 20s And 30s? The answer to this question depends on who you ask, but from the research we’ve completed, it is never too early to begin treating your face. Prevention is the key to anti-aging success. Unfortunately, many people don’t start to worry about aging until their skin has already begun to show signs of aging. Once your skin has been damaged by the sun, it takes 10 years for the damage to become visible. That means they were potentially damaging our skin since childhood. Many people begin to develop crow’s feet in their mid-20s. a)Cost: can range anywhere from $20 and up. b)Lower Doses: the lower the dose, the more inexpensive the cream will be in the long run. c)Multiplicity of Ingredients: the ingredients are extremely important. d)Daily Use: you will need to plan on using your cream at least twice a day. e)Side Effects: some patients do experience side effects. f)Individual Differences: different creams are made for different skin types. When it comes to caring for our skin, it is extremely important to use a product that contains high-quality ingredients with a proven track record of being effective in reducing fine lines and wrinkles. The essential ingredients in any product will increase skin hydration, boost and stimulate collagen production, reduce free radical damage caused by overexposure to the sun, and dramatically improve your skin’s texture and firmness. A great wrinkle cream will reverse the effects of aging and make your skin younger and more vibrant looking.